But the Event will Sell Out! * Again this year, we are limiting registration to the first 400 corvettes that sign up. * We will not allow any “Day of Show” entries. * No pup ups or easy ups will be permitted. * In accordance with FAA regulations, Seaport Village and Embarcadero Marine Park North are “NO FLY ZONE” for drones. * We do not have parking for car trailers. If you trailer your car you will be responsible for finding parking for it. * Check in has been changed to 8:00 a.m.; please do not arrive early. – Participants are not allowed to leave early unless it is an emergency. Please do not plan to leave before the awards begin at 2:00 p.m.
– Once the car show has officially started, after the time limit for load-in has passed, no show vehicles or service vehicles may be driven on to park property. All Corvettes must arrive by 10:00 a.m. This is what happened in 2018 – Don’t let this happen to You! RSVP so we don’t Hit the Road without You! We will Meet at Kohl’s at 5:45 am and Depart Promptly at 0600! The Largest and Oldest “All Corvette Show” in the USA! 1st, 2nd, & 3rd place participant’s choice trophies for each Corvette generation. favorite car in each Corvette generation. 2) For Sale – Cars for sale are welcome, you furnish signs etc. and the entry fee remains the same. Dash plaques & special gift to the All 400 entries. If you wish to park together, please arrive together. – Participants are not allowed to leave early unless it is an emergency. Please do not plan to leave before the awards begin at 2:00 p.m.
no show vehicles or service vehicles may be driven on to park property. All Corvettes must arrive by 10:00 a.m. 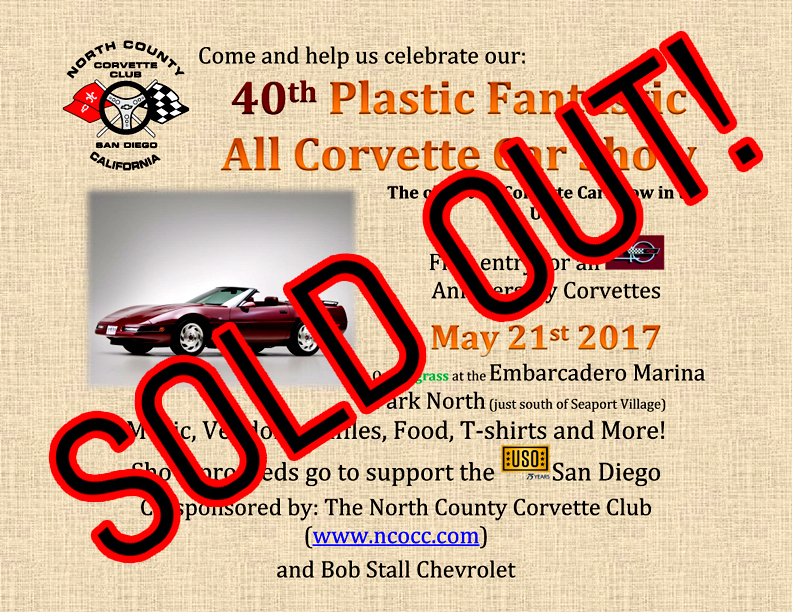 Please note: Members of The North County Corvette Club are not eligible for awards. Show proceeds go to The North County Corvette Club’s charity: The USO of San Diego. NO POP UPS (Easy Ups) WILL BE ALLOWED, AND IAW the FAA this is a NO-FLY ZONE FOR DRONES! Check in: 8:00 a.m. – 10:00 a.m.
Show Parking opens no earlier than 8:00 a.m. and closes at 10:00 a.m.
Participant’s choice ballots must be turned in by: 12:00 p.m.
Raffle Prizes: 10:00 a.m. – 2:00 p.m.